Today we packrafted the South Fork of the Sun River from our secret campsite near Pretty Prairie to The Gorge. 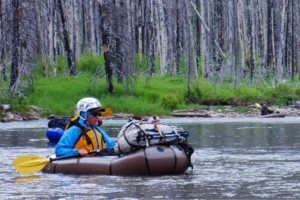 It may have been the funnest day of packrafting on the whole trip. The South Fork of the Sun is running at a healthy flow of around 550 or 600 cfs today, maybe. The waves are big, there’s lots of Class 2 water, and the rapids are splashy. Our packraft repairs held up through the whitewater and limestone riverbed. The day started off overcast, cool, and a little breezy, so we packrafted in our raingear to stay warm as waves broke over our heads and filled our boats with water. Eventually the sun came out and the day turned warm. We ended our float above the mighty South Fork Gorge, which was *almost* runnable. The rapids are about Class IV at these flows and only the exit rapid is problematic for the highly experienced whitewater packrafter, since it contains a razor sharp block of limestone in the middle that would shred your boat if you ran to its right. But if you go left, the current slams you into a wall. After you bounce off the wall, you’ll flip and hopefully exit your boat and porpoise over the logs that are spanning the width of The Gorge before watching your packraft pop from the broken widowmaker limbs jutting out like swords from the sweepers. We decided that bravery and stupidity are mutually exclusive. We are camped at a scenic spot under a stand of lodgepole pines above The Gorge. Our cooking area is lined with a carpet of grass and clover. A grove of aspens are quaking in the breeze 50 yards away. We can hear the roar of The Gorge from camp. The massive Sun Butte rises 800 feet above is. Its base is a five minute walk from camp. We fished this afternoon. The rivers are high and cold so the fish have to be earned. I caught two cutthroat trout, one 12 incher and one a few scales longer than 17 inches. I achieved my tenkara fisherman’s goal for the trip, which was to catch at least one fish using only one fly from every river we visited (Danaher Creek, South Fork of the Flathead, White River, West Fork of the South Fork of the Sun, and the South Fork of the Sun). This evening, skies are blue and temperatures are mild. We’ll sleep under the stars. We have traveled about 98 miles and have about 7 to go. Tomorrow is our last day. Today has been a happy, and playful day. It was a good type of day to have after the challenge of our Chinese Wall route and it’s ensuing physical, mental, and emotional hangover of the past few days. We are playing hearts again. Aiden and Nik are starting the fire. We’ll be eating fish soon. Our plan for tomorrow is to paddle our way to the finish. Our ultimate goal is to eat a lot of ice cream at Chubby’s (now Mel’s) in Augusta, take a shower, and enjoy the sunset over the Walling Reef back at the Boone and Crockett Club’s Theodore Roosevelt Memorial Ranch in Dupuyer, home of the Montana Council BSA High Adventure Base (MOHAB). Photo: Walker packrafting on the South Fork of the Sun this morning.